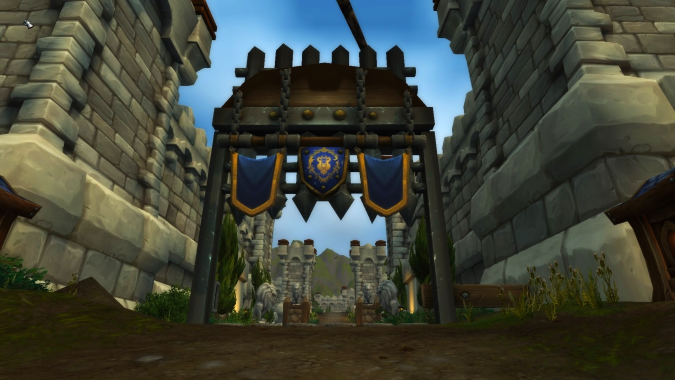 Warfronts are one of Battle for Azeroth’s big-name features, with the intent being that they recreate some of the feeling of building up a base in Warcraft 3. Earlier this week, Blizzard put Warfronts up for a 3-hour test on the Battle for Azeroth alpha. This gave us our first official look at the battles in action, and while there were some alpha-level hiccups, it was still a promising preview. Before we take a look at the testing itself, let’s do a quick rundown of what the heck Warfronts even are, though, shall we? As far as official Blizzard information, they’ve actually been fairly sparse in their doling-out of said info. Right now, all official information lists Warfronts as a 20-person, PVE-only scenario, though there are a few interviews that mention PVP aspects. However, given recent testing and the way Warfronts are practically a guaranteed win for the attackers, I’d count on them being strictly PVE content. Warfront control will be region-based (NA, EU, and so on). Warfronts become active after the soon-to-be-attacking faction gathers enough resources, similar to how activating building on the Broken Shore works now. 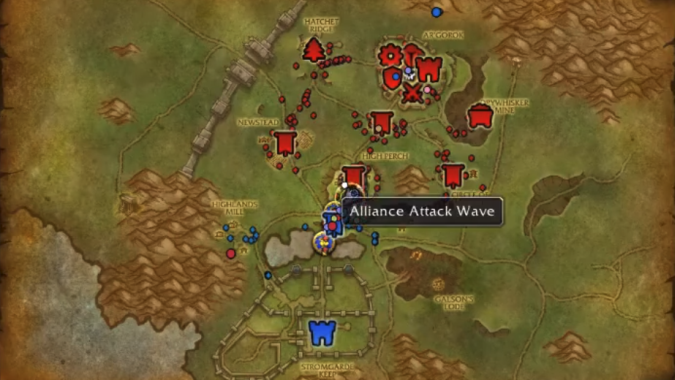 It will take roughly one week to gather enough resources and retake a Warfront. When one faction controls a Warfront, they will have access to certain World Quests and other bonuses. 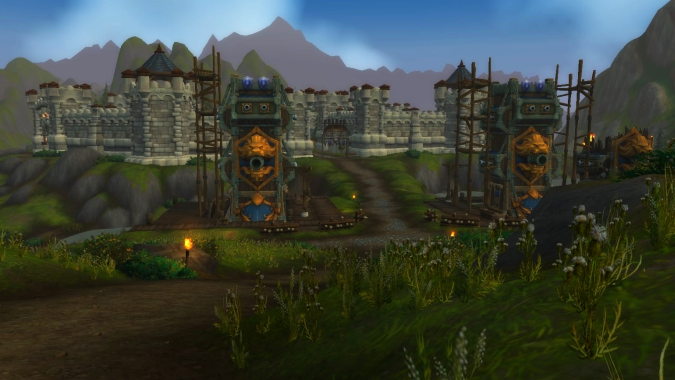 The first Warfront will be located in Arathi Highlands, with the attacking faction trying to gain control of Stromgarde. In order to win the battle, you must first gather resources, build up a base, and take control of the surrounding area before launching an all-out assault on the enemy keep. The first round of Warfront testing went live on the alpha earlier this week, which has allowed us to get a better idea of the feature. For the first round of testing, only the Horde side of the attack was available, and it took a solid chunk of the 3-hour testing block before the lag didn’t became its own challenge. That said, there are several VODs of the testing that give us a good look at the overall feeling of Warfront battles. The battle starts with your forces on an airship above a Horde base that’s under siege by the Alliance. Your first goal is to retake the base. After defeating the Alliance Sergeant in charge of the attacking forces, the base is yours. Your next steps are to rebuild your Great Hall and capture the two nearest sources of materials: Hatchet Ridge and Drywhisker Mine. In the most successful videos, this step was completed relatively easily. It’s the next stage that appears to take the largest portion of time to complete. Once you have the necessary resource suppliers, the next steps are constructing demolishers, capturing Valorcall Pass (the point directly in front of Stromgarde’s gates), and destroying the gates themselves. However, while you’re working on this stage, you’re able to capture additional points and construct additional buildings in your base. Not having tested Warfronts myself, I can’t say exactly what the benefits are to capturing and constructing outside of the specific requirements. Some of the buildings provide additional troops — extra healers, tanks, strong DPS, and so forth — and some provide various passive buffs. Having played Warcraft 3, I can say confidently that they’ll make enough of a difference in the final siege that you’ll want to complete most of the side objectives. Speaking of the final siege, once you’ve destroyed Stromgarde Gate, your final objective is right in front of you: Defeat the enemy Commander. In the Horde’s case, that means taking out Muradin Bronzebeard. Given he and Eitrigg are constantly trading insults throughout the battle, I imagine Eitrigg will be who the Alliance attacks, but this is alpha, so they could both be placeholders. Either way, Muradin doesn’t go down easily — there are several waves of guards in front of him, and he himself is a formidable adversary. But once he falls, a Warfront cache stands before you, and the battle is over. As promising as Warfronts are, I still have a lot of questions, and the lack of any official, detailed information doesn’t help. For instance, once a faction gains enough resources to activate a Warfront scenario, does the Warfront automatically swap over to that faction’s control? Or does that faction have to win a Warfront for it to swap? I know it might sound like the latter is the obvious answer, but if that’s the case, that means the first 20 people to win a Warfront are the ones to win it for their entire region. Sure, the entire faction will unlock the rewards at that point, but it still seems a bit off to me knowing I could have been part of the “hero team,” but I missed out on it because I wasn’t on at the exact moment a Warfront scenario became active. Is the outcome the same? Sure. But if the attacking side is practically guaranteed a win, I’d rather control swap over once enough resources have been gathered, not when one specific group wins a battle. And on the topic of battles, I still have no idea how long these are supposed to last. Island Expeditions are on record as being 20-30 minutes in length, but Warfronts seem to be another story. I realize it was the first round of testing — with a lot of lag and bugs — but some of the Warfront VODs easily made it to the 30-minute mark without much progress at all, while others somehow managed to complete the entire attack in roughly 35 minutes. I’m also curious as to how Warfronts will reward players. There are several datamined armor sets and weapons that are presumed to be Warfront rewards, but are rewards on a weekly lockout? Are they more like PVP rewards, with one rewarded per battle, based on performance? Or are rewards tied strictly to World Quests and other upon-activation events that result from controlling a Warfront? And finally — though admittedly less of a question — I’m curious about the resource gathering in the battle itself. Outside of battles, gathering resources is a region-wide, faction-based effort — everyone contributes (again, like the Broken Shore). Within the battle, however, it appears that players individually collect lumber and ore to contribute to buildings. I realize having a group-wide resource pool in Warfronts could result in abuse or another player using “your” resources, but per-person resource pools still feel odd to me. I’m not sure there’s actually a better system, but I still wouldn’t mind some sort of group-wide resource count to make it feel like the entire team were working together, cohesively. Despite the many questions I have, and despite the fact that we’ve only seen a very early version of Warfronts, I’m still excited for their official release. Blizzard’s goal was to recreate the feeling of building your base in Warcraft 3 and using it to lay siege to an enemy stronghold. From the videos I’ve seen, they’ve done that. That may not appeal to everyone — after all, the building-up portion can feel a bit slow — I can still see it gaining a dedicated fanbase, at the very least. My biggest hope right now is that we see more variety in whatever Warfronts are on the way. Orcs vs. Humans may be the backbone of the Warcraft franchise, but World of Warcraft is about so much more than that. Heck, Warcraft 3 was about more than that. I want to see Horde with a Forsaken-themed Warfront and the Alliance with a Night Elf-themed one. I want to see objectives that don’t all feel the same but with a different skin over them. Even if that means foregoing some of the out-of-scenario rewards, I’d be all for it. The Warfront we’ve seen in Stromgarde has promise — but that promise only emphasizes the potential future Warfronts have.